We just love their nutty flavour and texture; a great favourite in Middle Eastern, Mediterranean and Indian cuisine. They can range in colour from white, yellow, golden, brown, dark green or black! In India, the chickpea is referred to as gram, some varieties are milled into a fine pale yellow flour, used to make Onion Bhajias. Chickpeas are also the vital ingredient to falafel and hummus. These large white, kidney shaped beans have long been popular in this country, used in soups and hotpots. They are sometimes referred to as the Madagascar bean. Although, it is said to originate from South America and also goes by the name of Lima bean. In the USA large quantities of green Lima beans are eaten as a vegetable in the same way as we serve peas. Brown Beans – have an amazingly soft, buttery texture. They are another type of kidney or haricot bean and although loosely referred to as brown beans in Africa, they come in a wonderful array of colours and markings: brown to buff to pink and speckled. Pulses and legumes have the unique ability to produce nitrogen and so increase the fertility of the soil as they grow – very important in Africa! 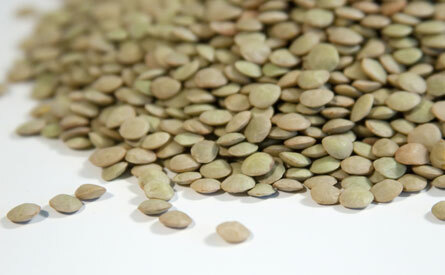 Also referred to as continental lentils; they have a firm texture when cooked and a delicious earthy flavour. Colours range from dark green and speckled to pale brown or green – all with yellow seeds inside their coats. Their latin name Lens culinaris and their double convex shape gave us the word for a similarly shaped optical glass and not the other way round! One of the most ancient of all pulses, they were first cultivated in the Middle East. Lentils are more easily digested than other beans and are very high in protein. Toor Dhal is in fact a pigeon pea and not a lentil as you might expect from its appearance. The dhal is prepared by milling dried pigeon peas to remove a thick coat and to split the seed. The origin of the plant is unclear, although they are now mainly grown in India. Young green pigeon peas are eaten in the Caribbean. Pigeon peas are noted for being highly nutritious, as well as for their delicate sweet flavour. Originating from North America, they have a slightly sweetish flavour and a floury texture. Most often associated with Mexican cuisine, they are however used throughout the Americas and the Caribbean and also India, where they are known as rajma. Red beans are an excellent source of iron.